Nicky, with sidekick Bob Carlson, dressed in his finest country clothes for one performance. The Rev. Michael Loomis, senior pastor at First United Methodist Church in Punta Gorda, sings and plays guitar during a previous Pastors Got Talent. The Rev. Bob Carlson, assistant pastor at First United Methodist Church in Punta Gorda, has been the driving force behind Pastors Got Talent for many years. The Rev. Bill Grant, teaching pastor at First United Methodist Church in Punta, Gorda, is a gifted tenor. Tyler Sherwin, a gospel magician from Indiana, performed at a recent Pastors Got Talent. The man who doesn’t move his lips wants a word. The Rev. Bob Carlson, assistant pastor at First United Methodist Church in Punta Gorda, an accomplished ventriloquist when he’s not in the pulpit, is planning another Pastors Got Talent Variety Show. Nicky, who usually speaks when Carlson is quiet, did not attend the interview session, so he was mum on the subject. But he’ll be at the church’s Life Center by Carlson’s side for the show, which will be held at 7 p.m. April 5. The event is not a fundraiser, and it is free. The basket will not be passed. Whether the church’s foundation shakes because of that departure from tradition, no one knows, but there will be a chance to donate at the door. Carlson and Nicky have invited several pastors from around Charlotte County to perform that night. They may do something of a spiritual nature or they may perform something secular. So, it’s not a church night. It’s a night for pastors with churches in Charlotte County to show off a particular talent. Carlson, who has been at Punta Gorda United Methodist since 2005, has been performing with his dummy, Nicky, for 18 years. It took a while for them to warm up to each other. “Growing up, I had no interest in it at all,” said Carlson, the son of a gospel magician who hailed from Upstate New York. His brother, on the other hand, saw the value and became a gospel magician himself. He was cleaning out their parents’ attic one day in 1991 when he came across a ventriloquist’s dummy still in the box. It wound up with Bob. At the time, Carlson was in charge of pastoral care at Fawcett Memorial Hospital. Carlson did nothing with the dummy except show it off to friends until one day, through either a series of coincidences or God’s hand at work, he met Jimmy Nelson. Nelson is a ventriloquist who appeared on television in the 1950s and 1960s. He is most famous for commercials for Nestlé chocolate featuring Farfel the Dog. 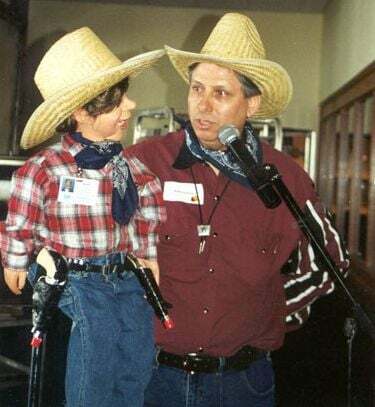 The day Carlson met Nelson — this was back in 2000 – Carlson brought the dummy with him. “He began working with its controls,” Carlson recalled. “And then he made it talk. Under Nelson’s mentorship, Carlson began taking lessons in ventriloquism at age 51. He started attending ventriloquists’ conventions. He took the dummy along. By that time, the dummy had a name: Nicky, named after a former parishioner. Carlson was 15 lessons in when he first performed with Nicky at a volunteers awards luncheon at the Charlotte Harbor Yacht Club in March 2001. They did 10 minutes opening for the band Country Pride. They have worked together ever since. The lineup for Pastors Got Talent was still being formed when Carlson was interviewed about the show. Nicky was not present because it was too early in the morning, and he’s no dummy. Carlson did say that it had been confirmed Elvis would be in the house. First United Methodist Church is located at 507 W. Marion Ave. in Punta Gorda. It has a website, www.whatis1st.com. WHAT: Pastors Got Talent Variety Show.